Do you remember that old card game called Happy Families? It is played with a set of picture cards, featuring fictional families of four, usually based on occupation types such as butcher, baker, greengrocer etc. The object of the game is to collect complete families by swapping cards with other players, and the first player to organise all their cards into complete families wins. The families of four in the Happy Families game consist of a mother and father and two children. But the happy families of the 21st century are very different from what they were when the card game was invented in the 1850’s. Families today come in all shapes and sizes! They are also often extended in various ways due to all kinds of reasons and circumstances. That’s why we at Venture have all kinds of different photographic packages to suit different families and different circumstances. If you want to have a family portrait done then there is bound to be a package that will be ideal for you whatever your family set up. This experience is currently at half price which makes it amazing value! 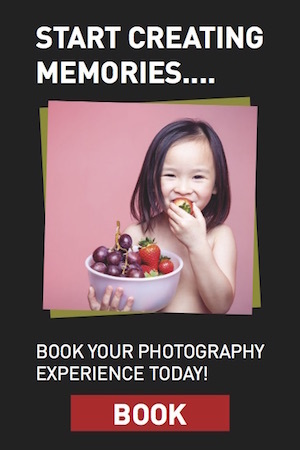 It includes a personalised photo shoot for all the members of your family - both individually and together as a group. Our photographers will spend time with each member of your family before the shoot to become familiar with their personalities and individual traits and ensure that these are reflected in the photographs. As part of the deal you will also take away your favourite image hand-framed in a stunning Midi sized Gallery, Vue or Metro frame (24” x 24” or 31” x 24” or 31” x 15”) valued at £700. The Gold family photography experience will result in family portraits you will love! It will perfectly tell the story of your family and we actively encourage you to bring along props that represent your passions and hobbies to really bring to life who you are. We will then photograph you separately and together for an experience and result that you will treasure for years to come. The experience includes your choice of a family portrait in a handmade Mini wall art frame in Gallery, Vue or Metro, (19” x 15” or 15” x 15”) valued at £370. The Silver Family Photography Experience and Bronze Family Photography Experience are both similar to the Gold, the difference being that the Silver experience includes as your 10” x 8” framed gift worth £165 and the Bronze includes a 7” x 5” framed gift worth £95. Many of us are fortunate to have children or pets - or both! - as part of our families. Both are very welcome at any of our family photoshoots and we even have experiences especially for them! Our New Born Photography Experience is aimed at babies within the first 14 days from birth, and includes a 2-hour photo session plus a hand crafted 5" x 5" framed photograph valued at £155. Our Just for Pets Experience treats your pet to a specialist 1 hour pet-friendly photo session and includes a 7" x 5" framed gift worth £95. This is a special joint pampering session for mums and daughters: wonderful experience! You will both enjoy an hour of professional hair and makeup styling followed by a 2 hour photoshoot. Enhance the experience by bringing along whatever your current favourite outfits are. Our skilled photographers will put you at your ease and get some wonderful shots that capture the essence of your special mum and daughter relationship. You will also get two 7” x 5” framed gifts valued at £190. If you know someone who would enjoy their own individual styled experience then we also offer a Styled by Venture Experience which includes an hour’s pampering by our team of experienced hair and make-up artists, a 2-hour photo session, and a 7” x 5” framed gift valued at £95. Any of the above experiences could make the perfect Christmas gift for you and your family! Whatever the make up of your family, each of our experiences would not only be a fun and enjoyable time for them but would also result in family portraits that will bring many happy memories for years to come. You can purchase vouchers for the above experiences directly through our website; or if there is any other information that you need then do not hesitate to contact us at Venture Studios. Vouchers purchased from now until 31st December have an extended validity period until the 28th February 2018. Whatever the pictures in your own unique version of Happy Families, let Venture make them special!